Nearly 200 Meyer Sound speakers have been installed in the three-screen Dolby Atmos-equipped Overland Park 18 cinema in eastern Kansas - to great acclaim from visitors and local media. For its first location outside of the north-west United States, the Cinetopia cinema chain has built three massive GXL screens, each equipped with a Meyer Sound cinema system and Dolby Atmos. Named Overland Park 18, this eastern Kansas theatre complex boasts close to 200 Meyer Sound cinema loudspeakers. The local media also noted the life-like detail of the Meyer Sound cinema loudspeakers. “When I heard the rain falling on screen, I could make out the drops, not just a swoosh,” wrote Jeneé Osterheldt, lifestyle columnist for The Kansas City Star. All three GXL rooms feature five Acheron 100 and five Acheron LF screen channel loudspeakers as well as eight X-800C high-power cinema subwoofers and two 500-HP subwoofers for low-end reinforcement. In addition, the slightly larger Screen 1 utilises 20 HMS-10 and 18 HMS-12 surround loudspeakers with IntelligentDC technology, while Screens 2 and 3 each deploy 42 HMS-10 and 6 HMS-12 loudspeakers. Each system relies on a Galileo loudspeaker management system with one Galileo 616 processor for drive and optimisation. 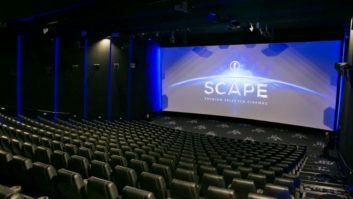 In addition to the Meyer Sound implementation of Dolby Atmos, Cinetopia’s GXL rooms offer giant screens up to 75 feet wide and four storeys high, 4K digital projection, and steeply raked coliseum seating with high-backed reclining seats. Meyer Sound cinema systems are also installed at Cinetopia locations Progress Ridge 14 in Beaverton, Oregon. and Washington state’s Vancouver Mall 23, which features Dolby Atmos. According to Coltman, Cinetopia will continue its national expansion, with its next luxury complex slated to open in the Dallas suburb of Lewisville. “Meyer Sound is ingrained in the GXL brand, so it’s part of what people identify as the unique experience found only in our theatres,” said Coltman. Built for linear reproduction, Meyer Sound cinema systems are suited to immersive formats like Dolby Atmos as the loudspeakers are designed to reproduce soundtracks with greater headroom, lower distortion, and superior uniformity. IntelligentDC technology is available in all Meyer Sound surround models to offer the advantages of self-powered, bi-amplified systems.